Unlike plants, Fungi undergo reproduction via Sporelation. This mean rather than depend on seed dispersal like we see in most seed plants. The main purpose of producing fruiting bodies(mushroom) is too help aid in the release millions of spores to germinate and grow into new fungi. Many mushrooms falll under the phylum Basdiomycota:Ganoderma lucidum, Lycoperdon pyriforme, and like Cortinarius S. these particular phylum fungi bore their spores on structures call Basidum. More specific these club like structures hold Basidiospores. All fungi are mainly classified by the mechanics of spore dispersal, visit my classification page for more information. As mentioned earlier fungi use mushrooms for spore dispersal. There are many adaptations that allow for optimum spore dispersal. Fruiting bodies in Basidiomycota are shaped much like and upside umbrella. Closer inspections reveals numerous gills that run parallel to each other upon the underside of the mushroom tip. When conditions are a signal activates the dispersal, as the spores fall from the gills in the millions. Cortinarius S. can undergo sexual and asexual reproduction. Also like plants fungi exhibit a similar form of alternation of generations. 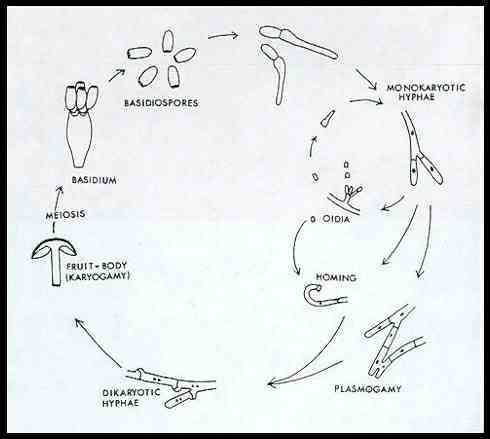 Fungi reproduce sexually via haploid spores. Once the spore lands upon a suitable substrate, the spore will begin to germinate and produce root like structures call hyphae. This will expand out from the spore and form a group of hyphae called mycelium. All this take place below ground until two hyphae will fuse (plasmogamy) and form a joined mycelium. Even though its two haploid hyphae fusing, the fungi is still not diploid despite having nuclei from both parents. Fungi unlike other organisms can post pone this fusion over a large range of time. This is called a n+n or a Dikaryon state, and is very important stage in Basdiomycota and Ascomycota. This Dikaryon stage can grow indefinitely until it is signaled to produce fruiting bodies(mushrooms). From there the fungi undergoes a fusion of the nuclei other wise called karyogamy. At this point they are in a zygotic state(2N) and form into Basida. The diploid stage is very brief in comparison to the whole life cycle of the fungus. Soon after the Basidium will produce spores via meiosis. These spores are haploid(N) and are stored on the basidium as mentioned above. The spores will receive a signal and will be released and the cycle starts again.